We're about thirteen hours away from seeing the new iPhone 3.0 software, and excitement is running high. Lots of rumours are saying that Copy/Paste is a certainty. I think they're right. What else could iPhone 3.0 bring to current iPhones? Here's what I think: - A new SpringBoard? A SpringBoard redesign to better handle multiple applications would be nice; multiple categories of apps, with a shelf at the bottom and arrow buttons to navigate through the categories with animations similar to Time Machine. 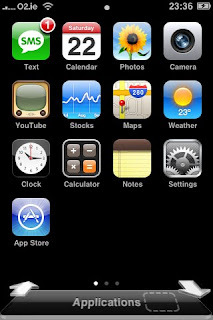 The usual Dock would be visible with a swipe on the center dot in the status bar, and is grown to accommodate two rows of icons. - Background Apps? Possible background apps, up to three; they 'minimize' to the shelf. Here's a Photoshop mockup of how I'd imagine 3.0 to look (drew this myself): - Copy/Paste? Kevin Rose seems to know his stuff; a doubletap on a word would bring up a roundrect loupe with quotation marks that you could drag around a selection and copy/cut. I think it will only work in certain applications, however. - Developer APIs? It would be nice to see a Maps API; although if there is one I'd be pretty sure it's not Google Maps and instead Apple's own renderings due to licensing. A Search API would be possible too, as would Core Data and Cocoa Bindings. There is definitely to be a digital compass in the next iPhone, according to whispers, so CoreLocation will sprout magnetometer support. - SDK? The iPhone 3.0 SDK will likely require Snow Leopard to run, especially if new language features like blocks and GCD come to 3.0. I'm guessing Apple will release a beta SDK for Leopard tomorrow, but only the beta SDKs will run on Leopard, not the final. - Codename? Hearing the word 'Kirkwood' bandied about a bit. Take that as you will… I'm really looking forward to seeing whether any of my wish list above comes true; I have St. Patrick's Day to worry about instead, but hopefully I'll be able to tune into Engadget's liveblog of the event. Hey Steve. It's Troy back from the old forums! I never knew you because an iPhone developer and became so successful with it. I saw your name on MacRumors the other day and it brought back some great memories. Hi Steve; I wonder if you are interested in developing apps for autism on an iphone? I am using photo albums to store pictograms that my daughter uses to communicate specific needs, (by color or another attribute) along with a photo of something she has had before. I would love to talk to you about what is possible. At the moment I loaded a cdrom on to my pc, then copied photos into an album and named it, then sycronised the album.